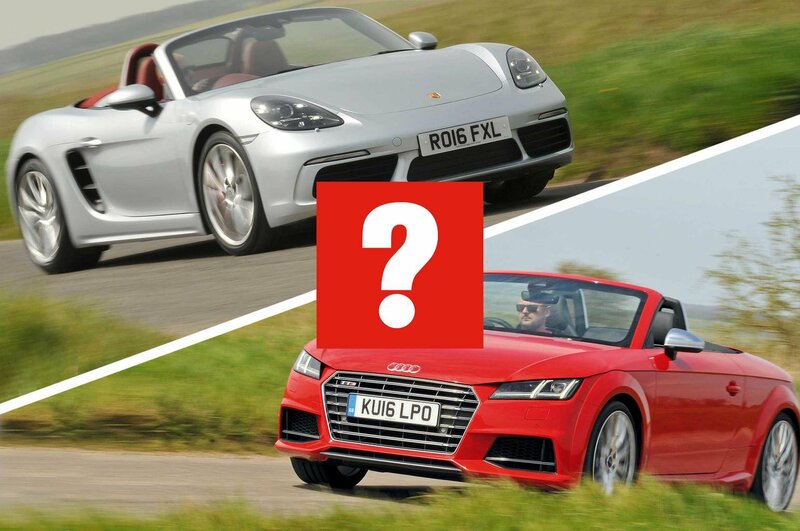 Porsche 718 Boxster S vs Audi TTS Roadster | What Car? One of our favourite drop-tops. Great to drive, easy to live with and makes Porsche look pricey. New engines add power and cut CO2 emissions, and there's mildly tweaked styling, too. The Porsche Boxster has long been our favourite sports car, with a mid-engined layout championed by many as delivering a better driving experience than even the rear-engined 911. Its six-cylinder, naturally aspirated engine has always sounded fabulous, too. However, to improve fuel economy and cut CO2 emissions, Porsche has just switched to a four-cylinder turbocharged petrol. It’s the sort of engine you’d usually expect to find in a Golf GTI, not a £50k sports car. The new 718 Boxster is actually faster than its predecessor, though, in both entry-level 2.0-litre form and as the more powerful 2.5-litre S version tested here. 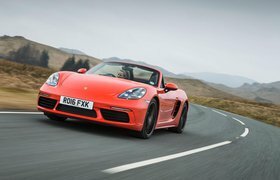 In light of this engine switch, is the Boxster still the benchmark in a class that includes much cheaper alternatives, such as the Audi TTS Roadster? 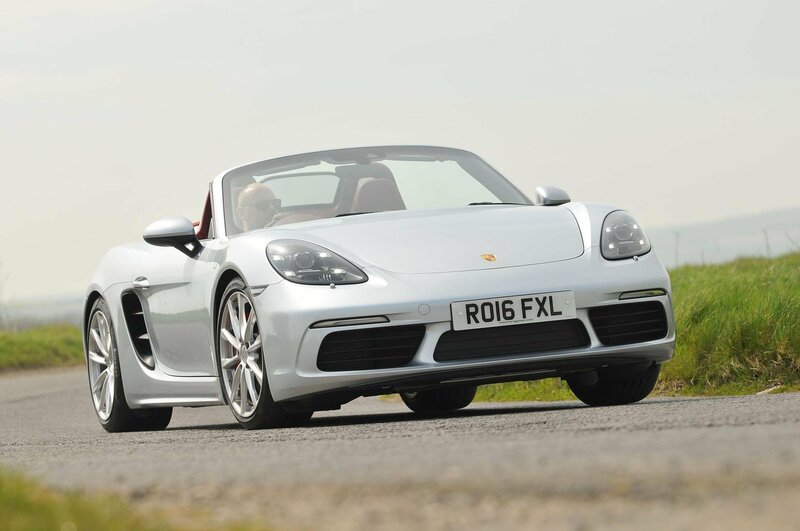 The Boxster has 39bhp more than the TTS, so no prizes for guessing which car is quicker. However, the margin was bigger than expected in our acceleration tests: the TTS took 6.0sec to do the 0-60mph sprint (nearly a second slower than Audi claims), while the Boxster did it in 4.5sec. That’s partly because the TTS is trickier to get off the line swiftly, despite its four-wheel-drive traction advantage over the rear-wheel-drive Boxster. Also, the TTS has relatively short gearing, so you need to make two gear changes to hit 60mph, whereas the Boxster will easily hit that speed in second gear. The Boxster’s gearchange is also more satisfying thanks to its positive, mechanical feel and shorter throw. Both engines are turbocharged, so there’s a slight pause after you press the accelerator before they hit their stride, but the Boxster is less hesitant and more ferocious from 2000rpm all the way to its 7500rpm limiter. The TTS, while still rapid, is less potent through its mid-range, and acceleration tails off sharply after 6000rpm, well shy of the 6800rpm rev limiter. In the past, the Boxster would easily have beaten the TTS for engine noise. Sadly, the sonorous symphony of its old six-cylinder engine has been replaced by a fairly lacklustre four-cylinder thrum. It doesn’t sound horrible, but it isn’t thrilling, and even the optional (£1328) switchable sports exhaust adds little to the soundtrack. You can play with the TTS’s engine noise without spending extra cash, and although it doesn’t ooze character, it is more harmonious and smoother. The Boxster has lost none of its handling skills, though. The way its steering builds weight and delivers feedback as you turn in to corners is little short of perfection. The TTS is agile, and its steering provides plenty of zip when you ask for a quick change of direction, but the connection between you and the road is less intrinsic. Both our cars had adaptive dampers (a £971 option on the Boxster and standard on the TTS). 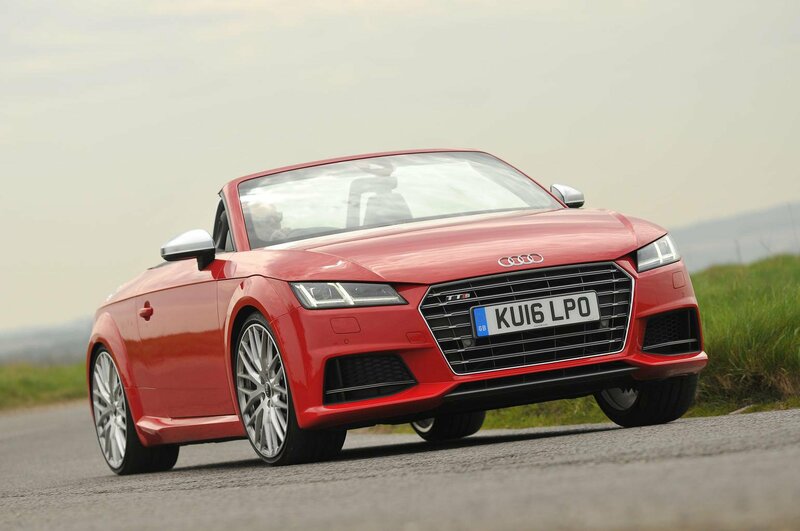 Even with the Audi’s suspension in its firmest setting, its body leans more than the Boxster’s during hard cornering. The Boxster is more of a pure-driving sports car. There’s a better balance between its front and rear axles and you can even use the accelerator to help point the nose of the car where you want it to go. In contrast, the TTS’s front tyres sacrifice grip at lower speeds, causing the car to run wide sooner through corners. The Audi never feels as precise or easy to place when driven quickly, either. In other respects, these two roadsters are harder to separate. They both ride firmly, but are comfortable enough to drive every day. The Boxster takes the sting out of sharp potholes better, but with the roof up the TTS is better insulated from road noise. With the roof down,the Boxster ruffles your hair slightly less, in part due to its standard wind deflector, which sits just behind the driver’s left ear.